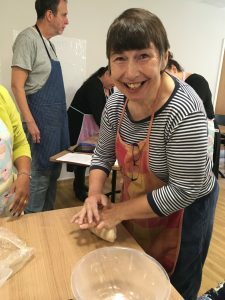 The next challenge for those involved is for them to put their new-found skills into practice, through our Baking a Difference sessions in local care homes and sheltered housing. 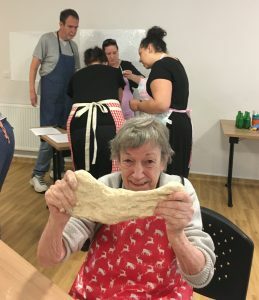 So that many more older people can experience the joys of bread, conversation and community. 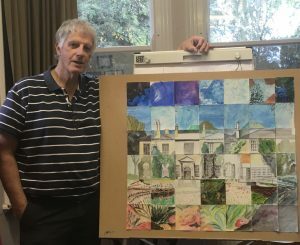 Experience met imagination recently with beautiful results – all thanks to retired architect and L4A volunteer Nigel King. 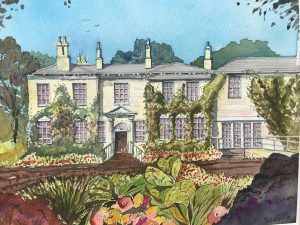 Below is Nigel’s watercolour painting, capturing the faded charm of Evington Park House, in Leicester. 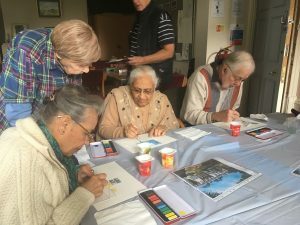 This was the inspiration behind the ‘Painting by Numbers’ workshop he organised and expertly led at a ‘Keep Calm and Get Creative!’ Wellbeing Day, held at Evington Park House itself. 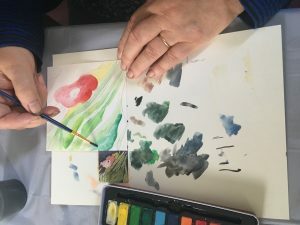 Nigel has been participating in L4A’s Social Prescribing project since June 2017 – first exhibiting his artwork at our patient-led community events within the Evington area. Coming from an architectural design background much of his work is naturally influenced by buildings in both urban and rural settings, including pencil drawings and paintings of local landmarks. Nigel commented “There are no rules in art and the concept of deconstructing and recreating something new appealed to me. Also, painting doesn’t have to be a lonely, solo exercise. This workshop was devised to be inclusive, enabling people of all ages, abilities and backgrounds to work together. I was originally reluctant to get involved in the workshop because of the time commitment but although it did involve a lot of work I found myself looking at the historic building with new eyes and in more detail. I enlarged the original artwork, re-drew and gridded it up then divided it into individual pieces so everyone could paint a square in their own way. Combined together, this produced a completely new, colourful work of art. It was a very sociable day and great to work with old friends and new acquaintances in a relaxed and happy atmosphere. 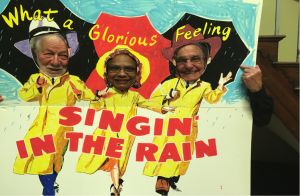 This special event was run by a partnership between L4A’s Social Prescribing project, WEA and Friends of Evington, and was part of the wider Leicester Ageing Together festival ‘Celebrating Older People in Leicester 2017’. It provided an ideal opportunity to showcase the invaluable contribution older people can make to the life of their local community – something which is at the heart of L4A’s Social Prescribing project. To find out more please contact Anita Barrand on 07964 091693 or email: anita.barrand@l4a.org.uk . Special Movie Matinee spreads that glorious feeling! 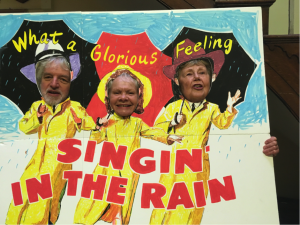 ‘Grand as owt!’ – a lovely comment made by an audience member after the movie matinee of Singing in the Rain’ – a unique event organised as part of our Social Prescribing project by L4A and Friends of Evington. 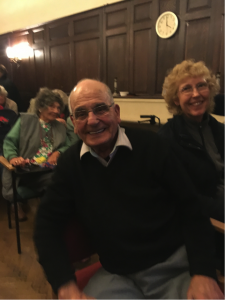 Fun and fond memories were shared by 40 delighted film lovers enjoying this ‘feel good’ classic at Evington Park House, and in all of its technicolour glory! With a mobile film unit hired from the Phoenix Theatre- a huge 10 foot screen, high definition film stock and quality ‘surround sound’ the Panel Room was transformed into a comfy cinema for the afternoon. And we will! 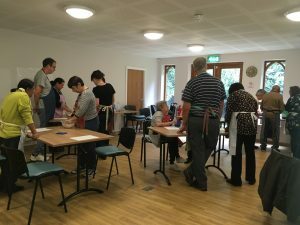 L4A’s Social Prescribing Project hopes to work in partnership with the Downing Drive Patient Group to plan another exciting social event soon. To find out more please contact L4A Project Coordinator Anita Barrand on 07964 091693 or email Anita.Barrand@l4a.org. Following the success of our ‘The Power of Stories’ project, which took storytelling into care homes and trained staff in techniques of storytelling, it’s been wonderful to hear about a developing legacy from the project. 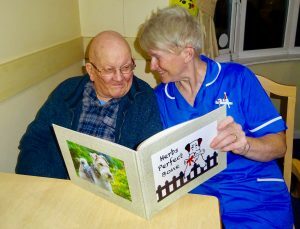 Karen Faver from West View care home has written and illustrated her first book, which she designed especially for use in the care home! 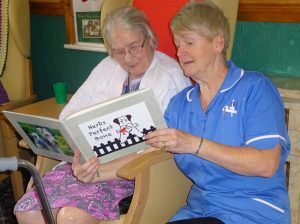 Karen undertook the training and mentoring offered by ‘The Power of Stories’ project and by the time it ended she was using storytelling regularly with residents at West View. 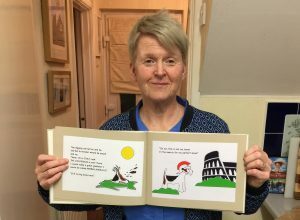 Inspired by the impact this was having, Karen combined her 21 years experience of working in care with both her love of drawing and her wire-haired fox terrier Herb – and ‘Herb’s Perfect Bone’ was born. The book tells the story of Herb as he travels around the world in search of his perfect bone. Discussing the story and seeing iconic images from the different countries Herb visits has given residents the opportunity to tell stories of their own – where they have been and what they got up to. Residents love it, as do their families and other staff in the home, as it helps enable recall and gives them something to talk about. Karen is delighted with the impact ‘The Power of Stories’ has had on her own life too. Plans are already underway for the next story, with residents fully involved and eager to think up new adventures for Herb. Since November 2015 we have been working with residents of Pilgrim Home Evington on ‘Tactile Textiles’, a project within Leicester Ageing Together, funded by the Big Lottery. 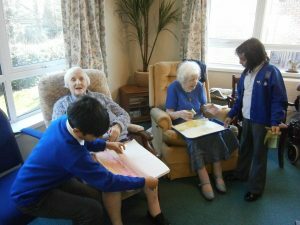 Each week small groups of pupils from Linden Primary School have been visiting a group of residents from Pilgrim Home. The combination of 9 and 90 year olds sharing creative activity has been a wonderful success, providing constant opportunities for young and old to share skills, ideas and experiences. 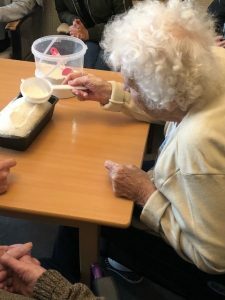 Whilst they were choosing fabrics, threading needles and learning how to finger knit, children have also heard about what daily life was like long before they were born and the older people have learned all about the latest playground crazes. The different ages have happily shared their stories and thoroughly enjoyed each others company – “I didn’t think the elderly liked being around children but as soon as we came here I realised that we have a lot in common – the elderly are very interesting” commented one of the children. 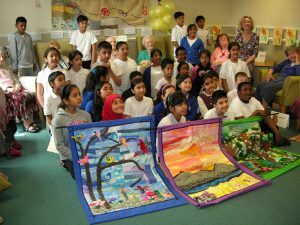 One of many highlights of the project has been celebrating the achievement of making three collaborative textile wall hangings, each depicting a verse from ‘All Things Bright and Beautiful’. Over the weeks these were stitched from scratch to designs created by the group, each hanging made up of six background pieces made by a younger person/older person partnership. Everyone had such fun in the making of all the elements for these and now the hangings are proudly displayed in the hallway of Pilgrim Home.